Megalodon was second in a point to point in Ireland. He is a strong looking horse who is new to the yard this year, and we are looking forward to seeing him run. Mr Stubbs I came across Mr Stubbs whilst looking for horses in Ireland having been placed to Durarigle and Big Man Clarence in point to points . He's a nice big horses who should make a lovely chaser. Duarigle was a winner of a point to point in Ireland. 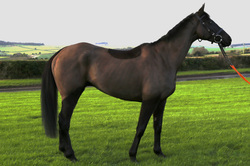 He is yet to run for us, and is a half brother to Tranquil Sea (rated 160). Purchased as a well bred 7-year-old, Ring Minella has now gone though his novice races and finished the season with a win at Warwick. .
Minella Tweet has won two races since arriving at the yard in April 2017. For Carmel won a point-to-point as a 5 year old, has been second twice in a handicap hurdles and finished the season with a win over fences. ​Mr Mulliner has won four races under rules and has been second with us now that the blinkers have been fitted. Listronagh Stone is a good moving horse who has won a point to point in Ireland. Hatchet Jack was 2nd in a point to point in Ireland. He has succeeded in Novice Hurdles and has shown great promise now handicapping. Abbey Street was 2nd in a point to point in Ireland.​ He continues his run being second three times as a novice last season. Amron Kali had indifferent form before she came to us from Ireland. Since joining us in December she won first time out for us under a confident ride by Nick Scholfield and has gone on to win three in total with many places. Doitforthevillage is an ex-Irish winning point to pointer who has won five chases for us last season and won the BetVictor Handicap Chase in November 2017. FOR SALE: Sizing Sahara is an exciting novice chase prospect. : A big strong horse who won several races for us . Un Beau Roman came to us from Willie Mullins. He has ran some excellent races, including winning a chase at Kempton the BetVictor Handicap Chase at Cheltenham. Mount Vesuvius has won 5 race and has been placed 19 times in over 70 races. He always produces a solid performance. Talk Of The South is another ex- Irish point to point winner. He is a solid performer who has turned into a real staying chaser. although he had been second ten times he finally won two nice races last season. He seems to love Warwick being second there five times and two wins. Minella Gathering ran both as a four and five year old before sustaining an injury. He won this year and was placed three times last season. Ted Bach came to us after winning and running competitively in Ireland, and won first time out for us.